I had heard of this wine but never tasted it until I was at a tea and champagne terroir exploration and lo and behold, it was there. The wine was stunning. 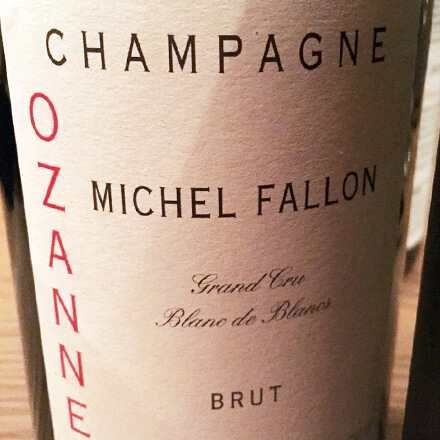 Fallon has worked with the champagne legend who makes deep, structured wines, Anselme Selosse. The lineage comes through in this bottle, which is from Fallon’s vines, but made in the master’s cellar. Disgorged in 2014 and I’m presuming it was based on the 2008 vintage. If you can score one, you’ll want to. It is gentle yet profound and very vinous. The bubble is delicate but firm. The nose is deep. All of the traditional goodies, the apple, the toast, and lemon. It is raised in oak but this just rounds out and deepens the goods inside. The length goes on forever. David slaves in biodynamics in the cold village of Trépail. One parcel for this plot was planted in 1957 the other in 1968. This is entirely from the 2009 vintage but as it doesn’t meet the requirements for aging, it is bottled as a non-vintage. Both fermentations are done in barrel. The result is a very vinous champagne from the 2009 vintage. 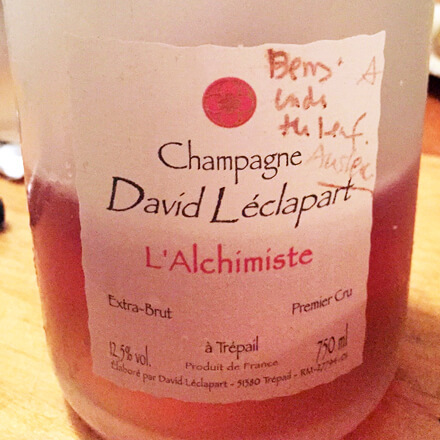 Fruit of berry, savory from under-leaf, there’s edge, a touch of fruit and typical Léclapart austerity but with 2009 richness–or a hint of it. A stunning wine.